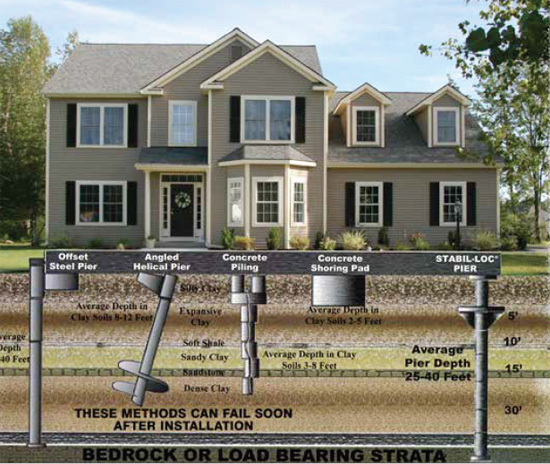 The Stabil-Loc Foundation Piering System is the number one method in the foundation repair industry for providing the homeowner with a permanent foundation repair solution. Our double walled heat extruded steel tube positioned directly under the center of the wall to be lifted or stabilized and driven hydraulically all the way to bedrock or stable strata provides the deepest, strongest foundation support available. The patented rotating head assembly maintains concentric loading during the lifting process. Traditionally, the house must be over lifted to insert shims. Our adjustable “shimblock” eliminates the need for over lifting the structure which can cause damage to your home. Our piering system, installation method and intellectual property is all patented by the United States Patent Office. The Stabil-Loc Piering System has been tested by Alpha Testing of Fort Worth, Tex. Alpha Testing is a registered Texas Engineering firm (#813) and Texas Geoscience firm (#50341). They specialize in Construction Materials Testing and Engineering– Earthwork, Concrete, Asphalt, Reinforcing Steel, Structural Steel Inspection, Pier Inspection, Post Tension, Roofing, Masonry, Special Inspections. Our piering system has also been extensively tested by the renowned University of Arkansas College of Engineering.